Today we went by the little grocery at the corner of our road. It's owned by a older couple, and they sell vegetables from their garden, local farmers and some items shipped in. I like the asparagus from their yard (which is, of course, out of season right now), the local honey, the bulk dried pineapple, and finding little unexpected treats. They often have loaves of freshly baked sourdough. Unfortunately, they are not open in the winter, and I learned that the last day of their season is tomorrow. I miss shopping there so much during the winter. Today I am preparing for Halloween tomorrow. I finished the last few stitches on Abigail's costume (ok, I still need to do a minor amount of hand-sewing to close a seam). Photos will hopefully be here soon. I have pumpkin bread in the oven. I'm trying a recipe I'm not familiar with and I hope we all like it. I'm planning a surprise spread for it too that I feel certain no one will like but me. 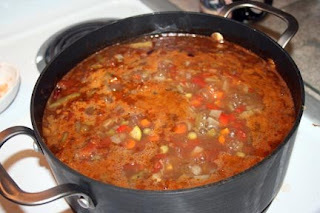 I will soon start making the chili that will cook tonight and then go in the fridge. 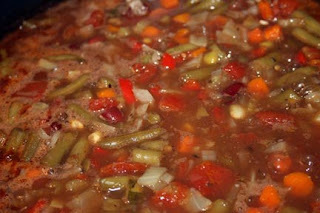 Tomorrow we'll put it in the crockpot so it will be ready for dinner with our family. Today we are having Chinese takeout for dinner because my girlfriend called me yesterday after she picked up some and I've been craving it ever since. We're trying a new restaurant. I hope we like it. Today I've been journaling about several of my childhood photos to use on a layout for Ali Edwards' Yesterday + Today class. I'm really enjoying looking through these old photos for little details that trigger memories. I can't wait to scan in a few more. Today I let Abigail paint two little canvas bags for tomorrow's trick-or-treating. They're very small, so I'll let her carry two instead of one. Instead of using seasonal colors, we painted them to match her costume. I also ended up with fabric paint on my linoleum and a kitchen towel. The good news is that baking soda will remove just about anything from linoleum. The bad news is that fabric paint doesn't really come out of fabric. We've had that towel a long time, though, so I'm not too worried. Today I had a very long to-do list and I don't think I even finished half of it (not to mention that there was a lot of stuff that needs to be done that wasn't on the list). I think I might need to make smaller lists. It can be self-defeating to see such a long list. It seems insurmountable. 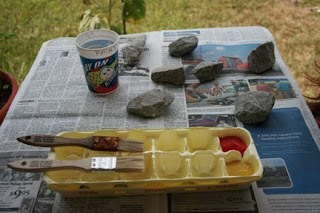 Today I am considering what to add to my Dia de los Muertos altar for the year. I haven't built one since I was pregnant (at least I think I did one that year), and I've missed it. I lost my Grandaddy about a year and a half ago and I'd like to honor him. And Mama gave me my Grandma's glasses when I was there last week, so I have more of her to add. I hope to discuss this ritual more next week. I hope you have a wonderful weekend. Enjoy the last few weeks of fall! I mentioned a few weeks ago that I had started taking Ali Edwards' new class Yesterday + Today at Big Picture Scrapbooking. Week five starts tomorrow (it's a twelve week class), and I'm so far behind. I've actually been out of town for the majority of October (I had a lot of posts in draft that I scheduled to post while I was gone) and while I've been reading the handouts, a lot of the first part of the class involved going through old photos and scanning them for later layouts. Needless to say, I haven't had a chance to do much scanning (or am I the only person without a portable scanner?). I did have the opportunity at my aunt and uncle's (Mama's brother) house to look through ALL of their photo albums (although I suspect I missed a box). I really wish I'd had a scanner with me. They live eight hours from where I grew up and while we were always close emotionally, we usually only saw each other once a year. When we did get together, my uncle managed to get some great shots of all the cousins together (I'm one of fifteen cousins spread out over twenty-four years). It was so exciting to see photos of myself and my memories that I hadn't seen before. The real treasure though was photos of my grandparents that I hadn't seen before. Most of them were taken when they visited my uncle, so they looked the way I remember them. I lost both my grandparents when I was twenty years old and I just can't help thinking at times that I just don't have enough photos of them. While looking through pictures of my PawPaw, I can smell his aftershave. The memory is so powerful and poignant. He was a difficult man at times, but I know he loved me and I miss him. I can almost feel the way his skin was leathery and a little scratchy when I'd kiss him. He's been gone fifteen years, and I fear that some memories have faded and I hold onto what I have. I have one photo of my Grandma where she's laughing hysterically and I can almost hear her. She had an infectious, almost cackling laugh. Kind of a cross between a cackle and a giggle, if that makes sense. I don't remember Grandma liking to have her photo taken. I think there are only two pictures of us alone together (I'm one of fifteen, remember). One is from when I'm a tiny baby. The other is from three months before she passed away. We didn't even know she was sick until a week later. We were leaving her house on Christmas Day and I suddenly had this urge to get my picture in my Grandma's lap (I was very small when I was twenty). There are two pictures: one of me stepping on her foot while sitting down and one of us hugging. I have no idea why I got it into my head to get this shot. I think it's the only picture anyone took of her that day, and it was a fairly large family gathering. The other pictures were of the two toddlers at the time - it was Christmas, after all. I have a reputation now for being a shutterbug. People hide when they see me coming. They want to fix their hair or their face or lose a few pounds or a few years before I get that shot. I've had it suggested to me that I superimpose an old photo of someone so they don't have to have their picture taken when they're "old". The ages of those suggesting that varies. I understand the sentiment. I have photos of myself that I despise. The thing is, though, I'm not taking the pictures of myself for ME. The pictures are for the people I love. The people who see me each day and will remember the everyday me. Dressed-up, made-up photos are great, and I love formal family portraits. But the next time you try to duck from a camera, think of your grandma or your mom or your dad or someone else you love and how you remember the way they look. And then maybe get over yourself a little. Feel free to remind me of this when I try to hide from your camera. I was prepared to write about something else today, but the headline The Great Baby Einstein Scam on yahoo caught my eye. Disney is offering a refund to buyers of its Baby Einstein videos because it turns out that babies actually don't get smarter from watching them. I won't be getting a refund because all of our videos were hand-me-downs. By the time my daughter was born, the American Academy of Pediatrics had already released its recommendation that children under age 2 not watch any television. So, I had several videos but we never watched them. I did feel some pressure to play them sometimes (from the insistent marketing of Disney) but I didn't. I didn't have any reasons to try to occupy her attention with the tv. I don't work outside the home, so unless we had plans I wasn't trying to get dressed or put on makeup. Occasionally, I wanted a shower but I wasn't going to let her watch tv alone while I did that (not judging others who do, but it just didn't work for my situation). The article I read asks, "So what now? Lose the Leapfrog? Whisk away the Wii? How do you plan on keeping (or cutting out) technology in your child's life?" Personally, I plan to keep doing what we're doing. Since Abigail turned two, we have allowed her to watch some tv. I try to stick to shows that I feel are appropriate for young children. She enjoys Toot & Puddle and Olivia, both of which are based on children's books that I love. I record Mister Rogers that our local PBS channel airs on weekends. We've recently started watching Sesame Street (previously we would watch Sesame's Play With Me Sesame that is aimed at toddlers rather than preschoolers). There are a couple of other shows that we occasionally watch. I aim for programs that show loving, gentle relationships. Toot & Puddle is about two friends who enjoy each other's company, enjoy their friends, and enjoy traveling and learning new things. Olivia is a little pig has a vivid imagination, and loving but firm parents who correct her when she's less-than-nice to her siblings. Sesame Street we mostly watch for the nostalgia factor for me. I don't think Abigail needs to watch it to learn the alphabet or how to read. I work with her on letters and numbers and colors. Sesame Street is for entertainment. We have a Wii, but it is certainly not intended for infant use. We enjoy playing video games from time to time (my husband far more than me), but I don't see us allowing our toddler to play for a while. I think small children should be interacting with people and objects instead of screens. That brings me to Leapfrog. I thought this was really cool when it first came out, and it is from an adult perspective. And of course pushing buttons to create lights and noise amuses children. I still believe, though, that there's a reason children get more excited about the box when they get a gift. There is far more potential in a box than in equipment that has already been designed by an adult. Consider: which would you prefer? 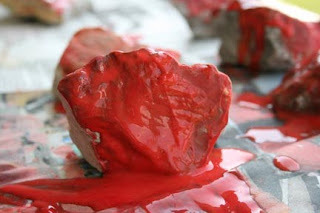 That your child create a cool object? Or that your child can work an object that someone else created? I know that I'm simplifying the issue, but it's still something to think about. 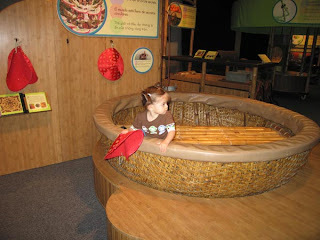 While we were in Chicago last November, I wanted to check out the Chicago Children's Museum at the pier. I found out that the museum was free on Thursday evening from 5-8pm, so we planned our trip for then. I was hoping my husband could get off work in time to join us, but it didn't work out. So it was just Abigail, my mom and I.
I really wanted to see the toddler area, and it was really cool. There were anatomically correct baby dolls and a tub to wash them. Abigail really got into giving the babies a bath, but when she started getting water all over us I choose to find another activity. 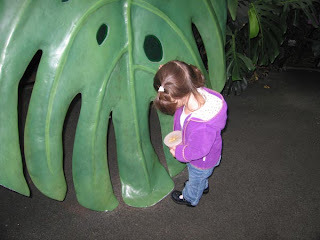 That's when we went to the Treehouse Trails exhibit that is designed for kids five and under. 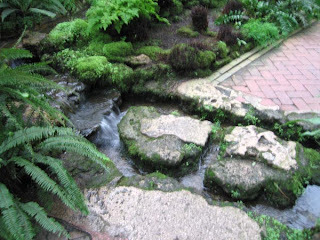 There is a stream for catching fish (or playing in the water again), a canoe, a garden (see photo) and a log cabin filled with an awesome play kitchen. There were a lot of kids there (it might have been a better idea to pay at a different time so it would have been less crowded) but Abigail held her own and cooked and gardened. It was Native American Heritage night or something like that, and a group was making this yummy flatbread. I think it was from the Navajo, but I didn't write that down. 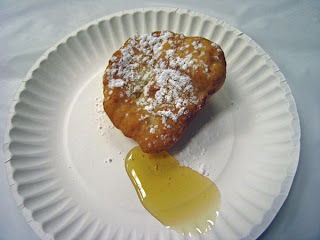 It was similar to a homemade donut, though. This boat was from a special exhibit on circles that was at the museum last fall. I took this photo because Abigail's great-grandfather built boats in Vietnam, and I wanted to ask her Grandma if this is the kind he built. What a cool connection if it is! One of the benefits of our Louisville Zoo membership is the reciprocal memberships we get at zoos all across the country. 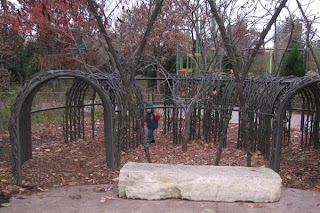 Unfortunately for us, in Chicago our membership only works at Lincoln Park Zoo, one of the country's only free zoos. And our membership does not help with the parking fee (which is $14). Regardless, we enjoyed visiting the Lincoln Park Zoo even though we got there only a couple of hours before closing time. Lincoln Park has the typical lions, tigers and bears. As always, we enjoyed all of the animal exhibits. The play areas were most exciting to the little girl who loves to get out of her stroller. 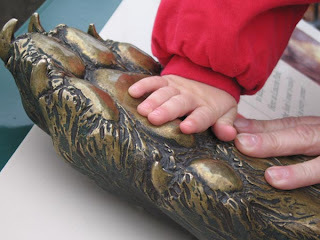 My daughter's and my mom's hands in the paw of a tiger. I love hand photos. If you do go to the Lincoln Park Zoo, be prepared for the parking price and get there early. Two hours is definitely not enough time to see everything at a leisurely pace. And a leisurely pace is what you get with a toddler! My mom arrived to Chicago on Wednesday (if you're just joining us, this is my story of our trip to Chicago in November 2008). I picked her up from the airport mid-morning, then we went to downtown Chicago to look for an Italian beef sandwich and the Oriental Institute. I was searching for a restaurant near the University of Chicago campus called Edwardo's. We had gone there on a trip several years earlier, and I remembered the Italian beef sandwich being wonderful. So we split a sandwich and a pizza and both were wonderful. The service was seriously lacking. I don't think she refilled our drinks the whole time, and we would sit for 20 minutes or more without seeing her at all. It was the same way the first time we went. Also, Edwardo's charges extra to put cheese on your sandwich, but they add cheese without asking. If I liked cheese it wouldn't be a problem, but I really don't. Other than that, we really enjoyed the food. The museum was the reason we were on the University of Chicago campus though. We went to the museum on a trip to Chicago in 2006 (the same trip where we discovered Edwardo's). It is filled with mummies and other artifacts from ancient Egypt, Persia, Mesopotamia, etc. I really wanted my mom to see the piece of the Dead Sea Scrolls. 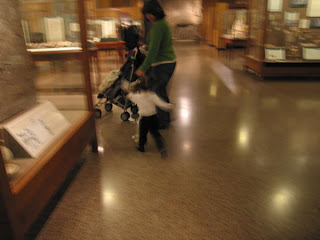 We learned that a museum filled with antiquities might not be the best place for an almost-two year old. She wanted to walk instead of ride in her stroller which might have been fine if there weren't giant sculptures throughout the exhibits. Sculptures that I was sure were either very old or very expensive and very heavy and didn't look very secure. My perspective during this trip was different (our previous trip was before I got pregnant), and I noticed more about the children's lives and about motherhood. 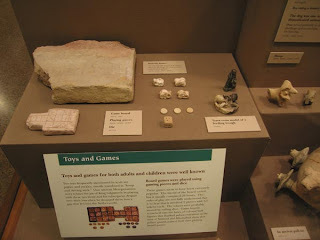 I found scrolls that were related to childbirth, and we were all fascinated by the toys and games that children played thousands of years ago. Sorry about the quality of the photos. I think I was trying something new by not using the flash and experiencing motion. Also trying not to get a glare from the display cases. The first day in Chicago, I woke up to find it drizzling and trying to snow. I had ideas of things I wanted to do, but I didn't really want to spend any time outside. It was a little colder in Chicago than it was in Louisville (where we live) and I just didn't want to deal with the rain and the cold with a toddler. I'm not sure what led me to the Garfield Park Conservatory. 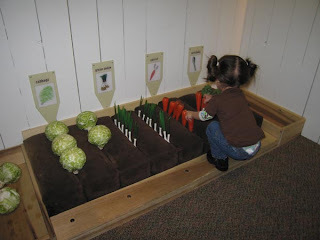 Maybe I googled indoor things to do with a toddler. Maybe I looked through my GPS until something struck my fancy. Whatever it was, we hit the road and found a treasure. One tip: if you plan to go, bring food with you or don't expect much. When I'm in Chicago, I only want Italian beef sandwiches and thought I'd be able to find one nearby. It's possible that I could have, but I was a little afraid to wander too far once I got there and all they had to eat were pre-wrapped sandwiches. I ate nuts and my baby ate puffs and we hit happy hour when we got back to the hotel. 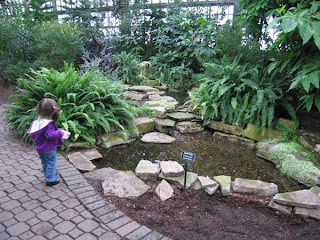 I was blown away by the Conservatory. It's absolutely perfect for a dreary day. I wish we had one in Louisville. It was so perfect for this nature girl. The rooms are huge, each one is themed, and my favorite was a forest with streams, large trees and waterfalls. We would walk around corners and not know what was coming next. What a perfect solution to winter doldrums! It's pretty old, and there are leaks in the ceiling and the walls and ceiling are essentially windows. You'll probably need a jacket just in case. There were several koi ponds that made peaceful spots to sit and eat our snacks. Who am I kidding? The baby ate snacks through the whole place. 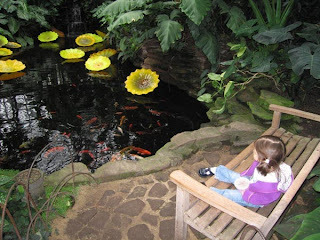 So if you're ever in Chicago and looking for a fun day enjoying nature but the weather is bad, visit the Garfield Park Conservatory. Or don't wait for a dreary day. There's also an outdoor garden that I didn't bother to see. And if you're a city planner in Louisville (or Atlanta, for that matter), please look into setting up a conservatory. We could really use something like this during the winter. 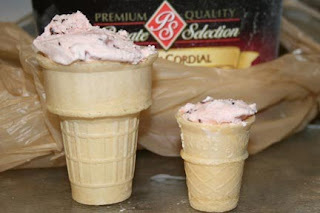 I've written about the kiddie size ice cream cones before, but wanted to show exactly how perfect the size is. On the left is your normal average sized cone, and on the right is the perfect little toddler cone. This is even enough for my six year old niece who loves ice cream. My two year old, on the other hand, has been known to polish off 3 without blinking. I would still rather that she eat the smaller cone, though. It's much more manageable for little hands. I've found them at Target and Walmart. The ice cream is Kroger's Private Selection Cherry Cordial. It's a better cherry chocolate chip ice cream than many brands I've tried, and it's one of our favorite flavors. This may be the best photo I've managed of the dress I made for Abigail for Easter. I used the flower girl pattern from Weekend Sewing by Heather Ross. I've been holding off on a review of this book because I just couldn't decide how to approach it. It's a beautiful book. I caught a glimpse of it out of the corner of my eye at Sams one day. 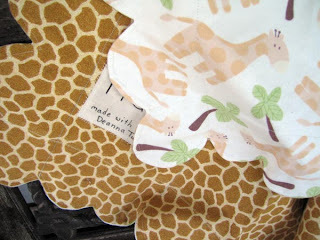 I had never heard of it, and didn't realize at the time that it was all the rage on the sewing blogs. Everyone was raving about it. All the projects look so yummy. I wanted to try almost everything I saw. I started out by making a head scarf. That went well (although my hubby didn't like it), and I enjoy wearing it around the house. It's a perfect "I have a 2 year old and didn't wash my hair today" scarf or a "I didn't sleep last night and forgot to brush my hair" scarf. I think it's great for new moms. It was spring and getting close to Easter, so I thought a great project would be making an Easter dress for Abigail. The flower girl dress looked perfect and simple, so I thought I'd try it. That's where my nightmare began. The patterns are printed on two large sheets of paper, front and bag. Each individual pattern is printed in a different color and the patterns overlap. So instead of cutting out the pattern and pinning it to the fabric, you trace the pattern using tracing paper and a tracing wheel. I'm sure that's not a big deal to experienced sewers, but I wasn't expecting it. It just seems really complicated. Plus the patterns are stuck to the inside covers with those glue strip things instead of a pocket like in Amy Butler's books. I really prefer the pocket. I also prefer spiral binding to hardcover for a craft/sewing book, but I think CK Media may have spoiled me in that regard. The flower girl pattern lists the fabric choices as silk shantung, cotton lawn, or linen. It then indicates that the possibilities are endless. Since I was making this for an active two year old and it wasn't for a wedding, I didn't feel the need to go with a fancy fabric. (I'm not entirely sure what silk shantung is, and I can't find cotton lawn in fabric stores in Kentucky.) We looked through the springy fabrics at JoAnns, and decided on this cute lavender daisy seersucker. As I went through the process, I began to curse the seersucker choice, thinking that was the problem. This was the first item of clothing I had made in over 13 years, the last being a pair of pajama pants I made using a Simplicity pattern. I have only ever lined handbags, but the bodice on this dress is lined. I didn't think it would be a big deal, but it ended up being a huge deal because the instructions in the book were incomplete. I read through them over and over and thought I was missing something or that maybe I should even quit sewing. I thought I must be stupid because I couldn't figure out where I was going wrong. Then I saw on Soulemama's blog that she made the same dress but had to adapt some instructions that were missing and I realized that a more experienced seamstress would realize the problem. I recently found an errata list on the flikr group Projects from Heather Ross' Weekend Sewing. It was so gratifying to find this group and learn that I was not the only one who was frustrated with the book. I want so badly to make the projects but now I don't trust the instructions. For example, when I finished making the lining on the dress, I looked for the part that told me how to sew the outside of the dress closed, but this step is left out completely. It might not have been bad if I'd ever made a project like this before but I had no idea what to do next. I also learned too late that the patterns are on the small side. The book states that the patterns are large, so I made the size 2 for my two year old. My daughter at the time was about 22 lbs. For those of you who haven't had toddlers around, this is approximately the size of a normal one year old. So I felt that a size 2 dress was sufficient. It turned out that the size 2 bodice was so small that if I finished the straps the way the instructions called for, I would not be able to get the dress over her head. I'm not sure if it's possible to put the dress over a child's head with the way the straps are intended. So I sought out hand-sewn snaps, and sewed them onto the spaghetti-width straps. I ended up finishing this dress at about 2am Easter morning, and I left it out for the Easter Bunny to put into Abigail's basket. She seemed thrilled with it when she found it that morning, but I've only managed to get her to wear it twice. Apparently calling it an "Easter dress" makes it only usable on Easter day. Point noted. This really is a lovely book, and is great for inspiration. I'll look through the errata that I found on flikr and see if I feel confident enough to tackle another pattern. My last complaint about the book is that so many of the fabric choices are for fabrics I've never heard of (and store employees haven't heard of either). I'm not confident enough yet to order large quantities of fabric online. And given the problems with the directions, I'm hesitant to sew a pattern that calls for fabric that sells for $20-30 a yard. Double gauze sounds lovely, but it's only available from Japan, and that involves high prices and large shipping costs. Perhaps someday I'll be that confident in my abilities (or in these patterns). I really really want to like this book. Maybe the publisher will decide to correct the mistakes and do a new print run. Have you read this book? What did you think? Please feel free to correct me or give me hints. Like I said, I really really want to like it. We discovered pretzel rolls about a year and a half ago when we had dinner at Weber Grill in Chicago. They serve these instead of bread before the meal. 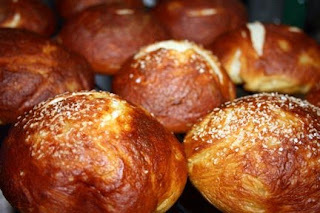 It's just pretzel dough shaped into a bun instead of a knot, but they are magic. We each had a couple, then took some to some of our neighbors and we still had just enough to use as hamburger buns the next day. They make fabulous hamburger buns. I'm trying to convince him to make them as hot dog buns too. I'm not a huge fan of hot dogs but I don't think it would be so bad to have one on a pretzel roll. I think I might need to convince him to make another batch soon, regardless of the shape. Yum. My two year old daughter likes napkins. We keep our (paper) napkins on a turntable in the center of the table, and she tries to grab a new one each time the one she's using gets a little dirty. If you've ever had a two year old, you may have an idea of how often that is! Actually, I'm able to go through an embarrassingly large quantity of paper napkins myself even while using the whole thing. So one day a month or so ago, after finishing a tote bag or something I realized that I had a fairly large scrap left, but it wasn't big enough to make a bag or anything. I loved the fabric and wanted to be able to see it often. Then it occurred to me that it was just large enough to make Abigail her own cloth napkin. When I gave it to her, I emphasized that it was her napkin for her very own to use during meals. She liked the apple and pear print, and was pleased that it was her very own. She showed it off to her daddy and used it at each meal. After a few weeks (of course I wash it every few days), she started to lean toward the paper napkins again. That's when I realized that it wouldn't be an effective switch unless the whole family participated. That night I went through my entire stash and pulled out varying sizes of scraps. You may recognize prints from a few bags I've made. The darker green has little cream hearts on it, and is from remnants of fabric from a dress I had made for a bridesmaid dress over ten years ago (yes, it's cotton, and yes the bride wasn't happy about my fabric choice). 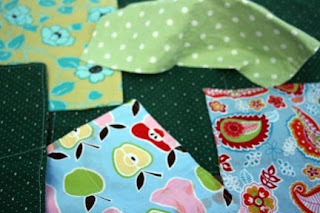 I made several more smallish napkins for Abigail, a medium sized one for me, and a large (18x18) one for my husband. (Just like the three bears!) I love mine far more than I expected. I don't really care for cloth napkins at restaurants, but I now realize that it's the fabric quality that I don't care for. 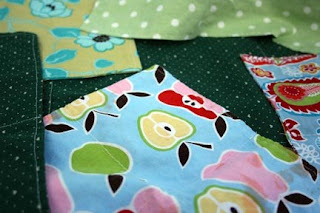 There is something to be said for making cloth napkins from quilting cotton! One of the napkins is more of a rectangle than a square, none of them match, and none of them are the same size. I think they really fit our family well, though. 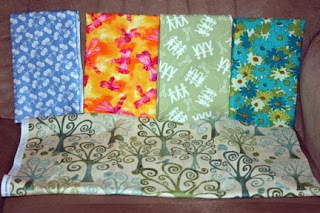 I'm on the lookout for more funky fabrics as it would be nice to have extras. These are double-sided instead of hemmed, and I "quilted" a folding line into them to make them more like paper napkins (we can easily fold them into quarters). I think I got the idea from the book Weekend Sewing by Heather Ross. We've hardly used any paper napkins since I made these, which is quite an achievement for our family. Yea for one less household expense! 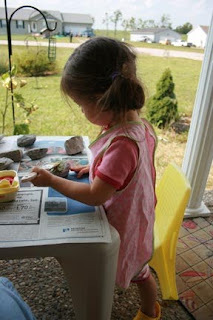 This is the nature table I made for my daughter last fall (2008). 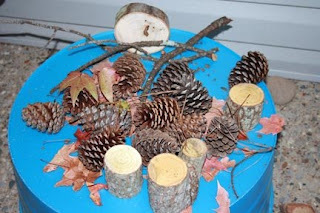 It includes leaves from the park a few miles away where my husband and I got engaged and some sticks, pine cones and tree branches ("blocks") from my parents' house two states away. I turned her kiddie "pool" (it's actually an ice bucket or something) upside down on our porch to use as the table. We have an extremely active kitty who could decide at any moment to eat or play with everything on this table. I thought outdoors might be the best place for it. I haven't made this year's table yet, but hopefully it won't take me a year to post it! I started taking Ali Edwards new Big Picture Scrapbooking class, Yesterday + Today, on Friday. The class is based on her philosophy of words + photos. From what I can tell, we will be making an album containing the stories (at least some of them) that we would want people to know about us if we were no longer here to tell them. Since I mentioned recently that I'm working on a similar album for my daughter, I'm very excited about this. We'll also have the ability to make some of the pages digitally using Ali's own digital designs she's made exclusively for the class. A few weeks ago, I posted my 12 stories that I wanted to make sure that I scrapbook. This class will build on that and help me get these stories in a album. I had several comments on that post about the time and organization that is involved in scrapbooking our memories. Scrapbooking does involve time and organization, but perhaps not in the way you might think. I've had to organize my photos (through the Library of Memories class at Big Picture Scrapbooking or the book Photo Freedom by Stacy Julian). I took the class, organized some of my photos according to the system, and then take a little time here and there to organize the rest (and stay current as I take photos). I do take time to scrapbook, but I still don't do it as often as I'd like. I try to make sure none of my pages take more than 15-30 minutes each. If my daughter is awake, I might set her up to draw or something else non-messy while she works next to me. I've actually had her work on pages about her grandparents with me. I put the photos down where she tells me, put a piece of patterned paper down where she tells me, and then I let her "journal." Then I wrote a little about the photo and her relationship with the grandparent and why I let her draw all over the page. I actually don't have Abigail's first year scrapbooked. I have the album and pages all ready but I haven't gotten around to pulling the photos or doing the journaling. I did keep a daily journal for most of the first two years, although I didn't start that until she was seven months old. I have notes here and there for that period. The point is, I'm not stressed about not having her 1st year album done. And I'm certainly not making her an album a year until she moves out. All the other pages are for me. (Actually, the first year might be for me, too. We'll see.) I scrapbook the stories and photos that I feel the need to scrapbook at the times that I sit down. I do not feel like I'm behind because I know where my stories and photos are and can get to them when I'm ready. If you're interested in taking Ali's class, there is still time to sign up. Registration closes on October 7 at 10pm. The work load is not going to be huge - just one layout a week. In related news, Stacy Julian is no longer blogging on typepad. She has started her own website at Stacyjulian.com. This website is meant to help fill in the gap left by Simple Scrapbooks. Not only does she blog from this site now, but there are also pod casts, playlists, and inspiration not only for scrapbooking but for life. I love the way this new site feels like a scrapbook of Stacy all on its own. Check it out. I'm really looking forward to sitting down to enjoy the pod casts. One of my goals is to help people see that scrapbooking is not all about cut and paste. The creativity part is fun, but my favorite part is the documenting the connection between people (and places and things). And using scrapbooking as a way to connect with people. My daughter loves to look through our People We Love section in our Library of Memories. We have four (not completely full) albums in this section, and most of the people we love live far away from us. It's so much fun to look through these albums and remember people we don't get to see often or introduce Abigail to people she doesn't know yet. Lucky Abigail got to have two birthday cakes this year. (Yes, her birthday was in January and I still haven't finished blogging about it. Maybe in 2010 I'll be more timely in my topics. Maybe.) We decided it would be simpler to have two small parties, one with family and one with a few friends, than to have one large party. Between our smallish house, age differences, and out-of-town family, we just thought this was a better solution. Both parties were Strawberry Shortcake themed because I love Strawberry Shortcake and have since I was about three or four years old. Her nursery is decorated in Strawberry Shortcake too. (I figured I'd get in my style while I had a chance.) 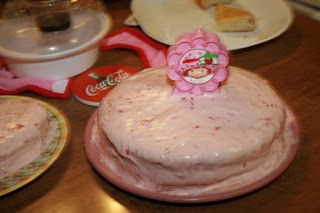 I blogged about her Strawberry Shortcake decorated cake a while back. I was raised by a baker and have been baking cakes from scratch (that's without a cake mix if you're not familiar with the term) since I was about nine or ten. I knew I wanted to make a strawberry flavored cake for the family party, and I used the same recipe I found online a few years ago. Actually, I found several cake recipes and several icing recipes and mixed and matched until I was happy with the results. I use a basic buttermilk recipe that calls for frozen strawberries and strawberry jello. The cream cheese icing uses fresh strawberries that are then drained. Obviously, I don't do a great job since the icing is falling off the cake. I have yet to make a strawberry cream cheese icing that is stiff enough. If anyone has any tips, let me know! I am starting the new Ali Edwards class this weekend (registration ends October 7 if you're considering it), and due to that along with some other obligations, I may not be around much during the month. I will post as often as possible, and I have some posts already written and scheduled, but I may not be able to approve comments very often. I moderate comments and approve them before they post to the blog. So if you comment and it doesn't show up for a few days (or longer), please don't worry. Don't take this to mean that you shouldn't comment though! I love receiving comments. It's encouraging to know that something I've written has inspired you to speak up. Here are a few things that caught my eye recently. Enjoy and have a wonderful weekend! Giving Your Children a Global Perspective @ Simple Mom - A list of ways to introduce your child to the world without traveling. Magic Beans @Highlowaha - These parents created some amazing magic for their little boy. Taking Dictation @Let's Explore - Another great idea on journal keeping with your children. Pecan Pie Bars @Magnolia Mom - I haven't made these yet, but I'm looking forward to it. I love pecan pie! 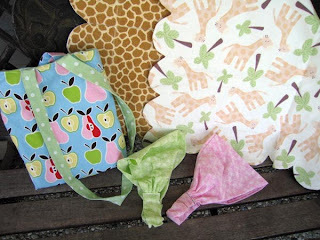 baby essentials @Sew Liberated - A new way of thinking about just what is essential for a new baby. Extra Credit @The PlanetEsme Plan - Reviews of kids' books about pen pals. I love kiddie lit, and I'm tempted by several of these. 12 Green and Frugal Lessons from my Mom @ Simple Mom - If the green part doesn't get you, the frugal part is really helpful! 8 Ways to Pursue a Lifetime of Learning @Simple Mom - It's unschooling for mom! And she doesn't say "never watch tv" which I appreciate. Lovable Lists and Lists to Jumpstart Lists @Write.Click.Scrapbook - Tips for list-journaling. You don't have to be a scrapbooker to appreciate this. The Enchanted Bookshelf @ Unplug Your Kids - How she got her son to enjoy reading. What a fun shelf! I especially love her tip to mix reading levels because sometimes even adults don't want to read at level. Magnetic Paper Dolls. . . @Skip to My Lou - She's not a scrapbooker and has found so many ways to make a Cricut a great family investment. I don't make titles for my scrapbook pages, so I didn't think I needed one. Hmmm. . .
How many parents do you know who won't allow (or teach) their children to cook or to play unsupervised in the front yard? How many parents are so afraid of their child(ren) being snatched by a stranger that the kids are kept within sight at all times? How many times have you told your children not to talk to strangers? How likely is it that these precautions will keep your kids safe? 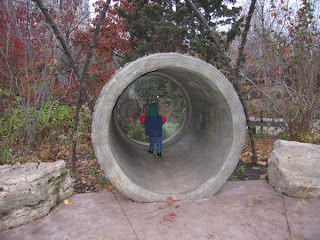 I promised a post on Free Range Kids: Giving Our Children The Freedom We Had Without Going Nuts with Worry soon, so here it is. I saw the author on the Today show last spring (or Dr. Phil or something), then I saw the book at the library a couple of weeks ago and then I saw on Simple Kids blog that they were going to discuss the book this week. So I picked it up from the library on Saturday. I really wish I'd taken notes as I read because there was so much I wanted to discuss. The author, Lenore Skenazy, is a syndicated columnist who wrote an article last spring about the day she let her son find his own way home from a New York department store with a subway map and $20. I admit, the thought of leaving my own nine year old alone in a huge city and saying "find your own way home" scares me silly, but her nine year lives in New York, had been on the subway countless times and could take care of himself. And he was so proud of his accomplishment. After reading this book, I've realized that she is not insisting that we all drop our preteens in the wilderness (or city) and let them fend for themselves. She is advocating returning to a belief that children can accomplish things instead of not allowing them to do anything for fear that something could happen to them. Actually, it reminds me of the scene in Finding Nemo when Marlin tells Dory that he promised Nemo that nothing would ever happen to him. Dory says "Well that's silly. If nothing ever happens to him, well, nothing will ever happen to him." Or something like that (actually, Ellen, perhaps I've stumbled on the reason there is no Finding Nemo II). Simple Kids has a list of 5 Positive Character Traits Encouraged by Free-Range Parents that will help explain the book. The book is broken into two parts: the first part is 14 commandments of free-range parenting; the second is a guide to things you may be worried about and why your worries are or are not valid. The commandments include things like "Eat Chocolate" at Halloween because there is no documented case ever of a person putting poison or razor blades into candy or apples and handing them out to trick-or-treaters. There are cases of kids being poisoned or harmed at Halloween but those were all cases where a parent or relative used the cover of Halloween to do something to their own child. But because of rumors of this kind of thing, we don't allow children to trick-or-treat alone, we don't accept home baked goods as treats, and some parents even x-ray their children's haul. All this to prevent something that has never happened. I think my favorite chapter is "Ignore The Blamers" - about ignoring other parents who know better than you do. Like the mom who yelled at me in the grocery store parking lot that my daughter was going to get sick because she wasn't wearing a coat. There was an unexpected light snow at the time, but I had to go to get something from the store while I was out (we live 15 miles from the closest town and I don't leave the house that often to save on gas). I didn't have a coat with me, and the walk from the car to the store was only about 10 yards. I'm sure she thought my daughter would catch pneumonia in the time it would take me to grab the items I needed for dinner. The implication, though, is that I can't take care of my child, and that this stranger knows better than me what I should be doing (does she also know that going out in the cold doesn't cause illness?). My parents got a lot of flack when we were kids for being "overprotective." We weren't allowed to watch certain tv shows or movies until we were older (like Golden Girls and Who's the Boss? ), we weren't allowed to hang out at the mall alone, and I wasn't allowed to date until I was sixteen (I don't think my brothers were interested in dating until later, so it wasn't an issue). I've watched some of the things that we weren't allowed to see as kids, and I still think they aren't appropriate for young kids. Even today, there are a lot of shows that are suggestive, show kids mouthing off to their parents and simply aren't written with the development of young brains in mind. I wasn't allowed to hang out at the mall with my friends because it was 45 minutes away and we knew kids who shoplifted when they were unsupervised. I was allowed to hang out in the woods alone for hours, though, which many other kids my age were not. I also know that not dating until I was sixteen was the best thing for me ( and would probably have been a good idea for other girls I knew). I might even tack on the stipulation for my own daughter that she can't date anyone two years ahead of her in school. We'll see. I also get flack for not being independent because my parents were protective (which is what free-range parenting is all about - raising independent kids), but as mentioned, I played in the woods alone (or with my brothers) for hours. I knew how to cook a full meal for a family of six when I was ten, and was also caring for three younger brothers while my parents were just out of earshot. I babysat often as a teenager, often for families we didn't know well. When I was in high school, I twice went to Washington, DC on school trips and spent times wandering the city without a chaperon (we were perfectly safe and learned to navigate the Metro easily). I went away to college where I learned to ride the train and walk through the city because I didn't have a car. At twenty-four, I moved nearly 500 miles from my family to be with the man I love in a city where I didn't know anyone else or even have a job lined up. Many of these things (minus the moving away) are things that a lot of kids are not allowed to do anymore because something might happen - and it's not like I grew up in the fifties. The most interesting part of the book for me, though, was all the facts and figures about child abduction. Did you know that your child is 40 times more likely die as a passenger in a car accident than to be abducted by a stranger? Did you know that the majority of the children on the milk cartons were abducted by parents or someone else they know? Did you know that children are more likely to be molested by a relative or family friend than by a stranger? Do you tell your kids not to talk to strangers? What if a stranger walks up, says "your mom told me to come get you" and your kid goes with them because this person isn't a stranger anymore, while all the while someone they don't know is sitting nearby and could help them? Everyone you don't know isn't a creep and some of the people you do know are. There are some things about the book that I had issues with but it was mostly minor. The author talks a lot about not reading parenting books by experts because they don't know your kid better than you - but she wrote a parenting book and expects you to listen to her. And the commandments "Study History" and "Be Worldly" remind us that childhood has been different than now throughout history and is different in other cultures. She lists examples such as children as young as six being sent away from their families to do hard labor in the nineteenth century or children in Liberian villages today who have little or nothing to do with their parents (who are working) and spend all day with other children. I understand her point (I think) but I don't think I care how independent a six year old gets by having an apprenticeship, I believe there is a purpose to childhood (studies show that play is necessary to learning). And I think that having little to no relationship with your parents is kind of sad. I believe having strong family relationships is good for society. This book is a quick read, and provides facts and figures on many of the supposed dangers that we fear. I knew some of it, but didn't have the figures on hand to back me up. So read the book, visit the Simple Kids Book Talk to check out other bloggers thoughts (links in the comment section), and the Free Range Kids site, and let me know what you think.